The CP integrates MS Exchange Server hosting that enables you to send and receive electronic mail and other forms of interactive communication through computer networks. The centralized e-mail servers connect to the Internet and private networks where e-mail messages are sent to and received from other e-mail users. Exchange Server offers you integrated collaborative messaging features such as scheduling, contact, and task management capabilities. Mailbox is an area in memory or on a storage device where e-mail is placed. In e-mail systems, each user has a private mailbox. When the user receives e-mail, the mail system automatically puts it in the mailbox. 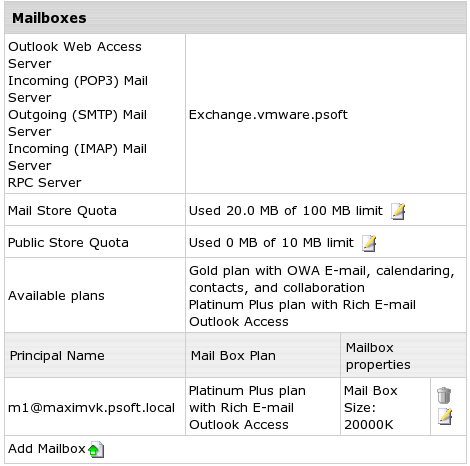 Increase Mail Store Quota and Public Store Quota by clicking on the edit icon and agreeing to charges, if any. Remove an existing Mailbox by clicking the Trash icon next to the Mailbox you need. Mail Forward - indicate the e-mail address for your mail forwarding. MS Exchange allows you to set up Internet SMTP domains, that you may want to accept messages for. Note:You cannot remove SMTP domain with a mailbox already created on it. You can add MX records to the specific SMTP domain. Click to enable necessary domain. Once it's enabled, DNS record is created. 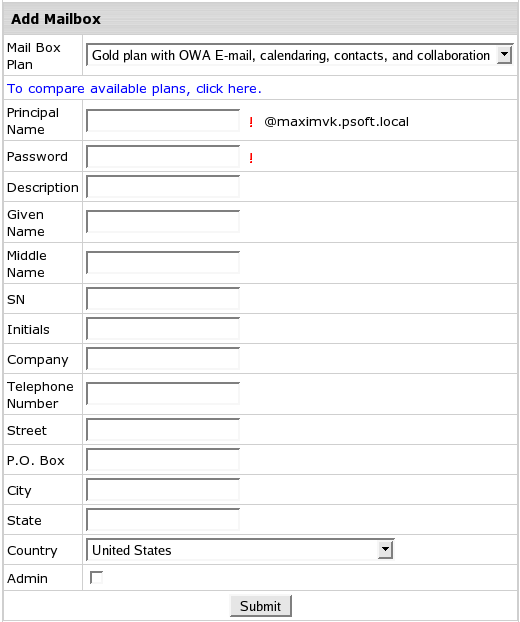 Note: Enable an MX record only if the domain is created in this account and is used for MS Exchange hosting. Do not enable an MX record if the domain is registered with another hosting account. In this case, add the corresponding MX record into the DNS configuration of this other hosting account. A Distribution list is a list of e-mail addresses identified by a single name, such as list_name@domain.com. When an e-mail message is sent to the distribution list name, it is automatically forwarded to all the addresses in the list. MS Exchange allows you to manage centralized mailing lists for groups of users.